Mr. Cirman and Mr. Gabrovšek founded the company in 1989. The growth of the company started in 1990 with projects involving hazardous waste (PCB) disposal and preventive maintenance in the energy industry. The company achieved complete recognition in 1996 by acquiring two contracts on the project for the reconstruction of hydroelectric power plants on the river Drava that was financed by EBRD (European Bank for Reconstruction and Development). The decision to establish the new company was made in uncertain economic conditions with no hope of a brighter future and in accordance with the possibilities of the Enterprises Act that enabled the establishment of limited liability companies with private ownership. The company´s growth is connected to the growing confidence of power companies that recognised C&G is a partner with the knowledge and the will for joint development projects. Another important lever for the company’s growth is the engineering department. From simple engineering projects, which often included the supply and installation of equipment, the company’s progress based on acquired knowledge, experiences and references. Now C&G is a qualified company with expert knowledge in engineering services, from design, construction supervision, consulting services to turnkey projects. In the field of power supply infrastructure, the company has participated in construction projects of distribution transformer stations, overhead lines and cables. In the electricity production field, the company also worked on construction and reconstruction projects of HPPs, the maintenance on TPPs and construction of cogeneration power plants. In recent years, the company, with rich experiences in the area of electricity infrastructure, also started cooperating in railroad and pipeline projects in the field of power engineering and system management. The most valuable asset of the company are without a doubt the skills and experiences of our employees, who build an external image of the company and, with good interpersonal relations, create an atmosphere in the company that makes development and teamwork possible. The development of partner relations with our customers and suppliers is definitely the main premise of the business, allowing the approximation of our offer to customer wishes with a set of services and products provided by strategic partners of the company. Continuous improvements of service quality and monitoring customer satisfaction in compliance with modern quality standards are the basis for increasing customer loyalty. Innovations and development of new services and products, however, also create new needs for old and new customers. Due to the successful development of the temperature control system on overhead lines, which allows transmission system operators to improve energy transfers and safer operation of overhead lines, the management decided to change the organisation of the company after 20 years and separate the production of temperature control devices for overhead lines from other activities in the company. 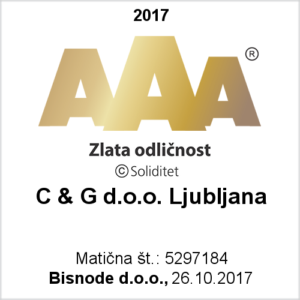 Within the framework of C&G group, C&G Ljubljana will continue its mission, whereas OTLM company will offer solutions for temperature control of transmission lines on the global market. Flexibility and knowledge that are imbedded in our business practices enable the adaptation of the company to market changes. Out offer includes services and products for the construction, maintenance and operation of energy facilities, including ecology related services. Developing partnerships with customers and key suppliers and introducing new services and products are key strategies of our business. The organization of C&G is adapted to the business process that is designed on project principle and the flexibility of the company.